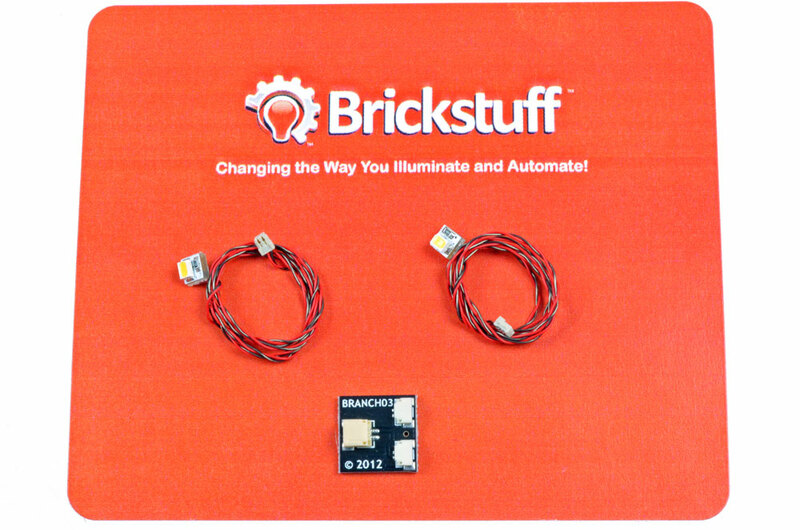 Brickstuff Products - Brickstuff-- Small Lights for Big Ideas! These are the easiest way to get started with our lights. The kits include everything you need to get up and running. Your Creations + Our Lights = Awesomeness. 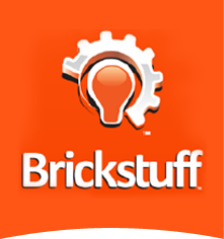 Our mission at Brickstuff is to manufacture and distribute lighting and automation products you can use to bring your creations to life. Everything is modular, and it all works together. You just need to ask yourself how much light and power you need. You can always expand or swap out parts later as your needs change, so jump in and take a look at our latest products! We are proud to offer our products for sale on Tindie, the maker marketplace. All of our products are available to ship worldwide. You asked for it, so we made it! An all-in-one starter kit with six Micro Light Boards, power, adapter and extension cables, sticky pads, and one of our 2-channel Lighting Effect Controllers. This is definitely our best deal available-- save almost 20% vs. buying the parts in this kit individually! 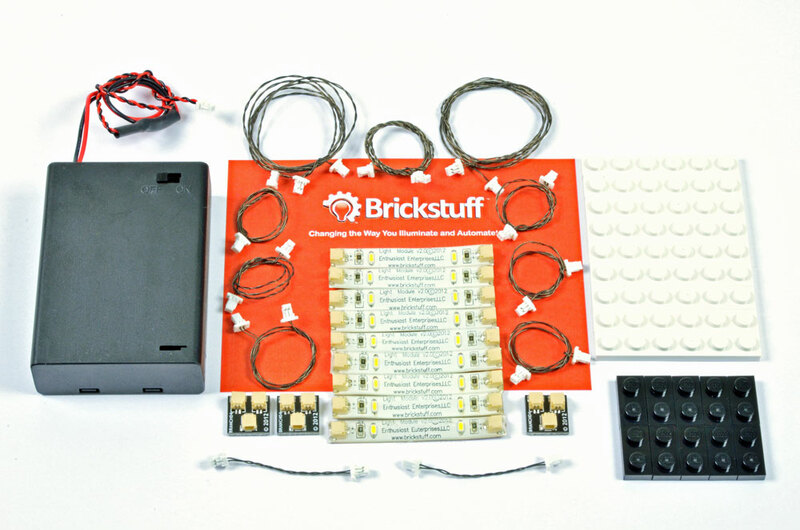 This kit has everything you need to light a standard LEGO® Modular Building kit: nine 2-LED light strips with self-adhesive backing, a battery pack, and all the connecting cables and adapter boards you need to light a large building or similar-sized creation. 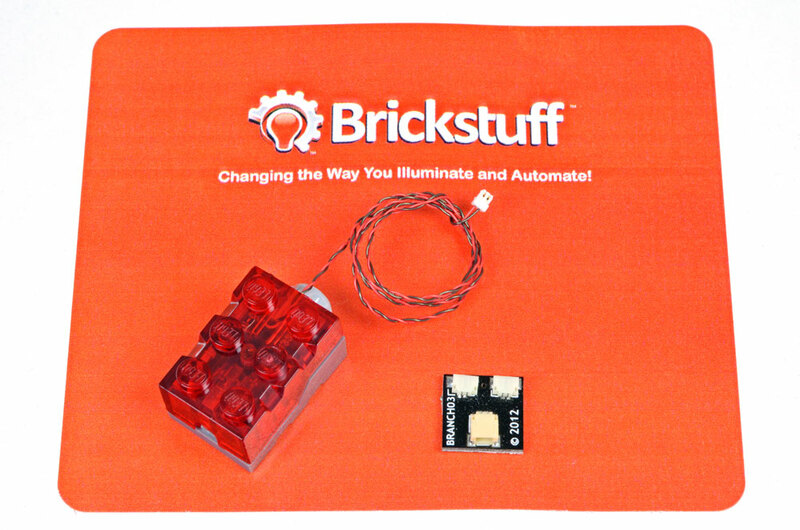 This kit also includes nine 1 x 6 LEGO® plates for mounting the light strips and 10 1 x 2 LEGO® plates for holding the connecting cables in place. If you want to fit lights into really small spaces, this is the starter kit for you. It has eight of our 1-LED Micro Light Boards (each less than 4mm square! ), 16 self-adhesive squares for mounting the Micro Light Boards, seven adapter boards, and seven connecting cables of varying lengths to connect everything together, and a battery pack to get you up and running right away. The connectors on the Micro Light Boards will fit through a standard LEGO® stud hole, so you can put light anywhere you need it! 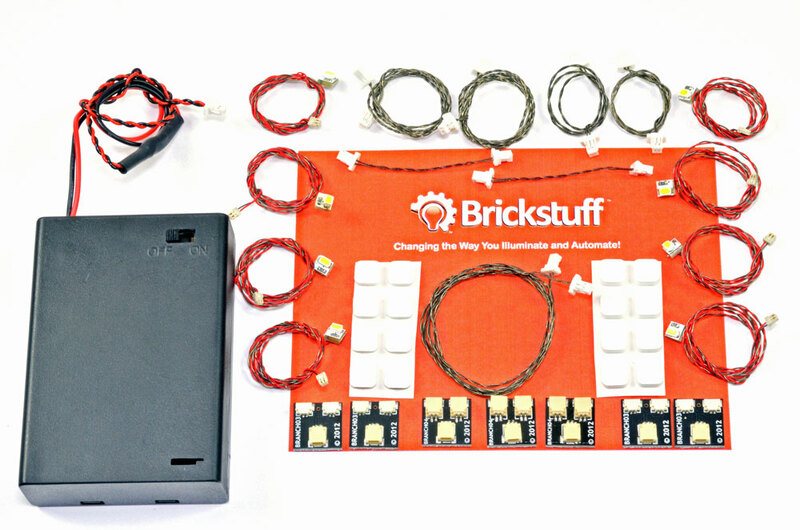 Looking to add to your starter kit, or to create a custom installation from the ground up? We offer two different light-emitting diode (LED) light modules to meet every kind of need: a 2-light flexible light strip with adhesive backing and a Micro Light Board for fitting into the smallest spaces. We also offer our Micro Light Boards in "raw" form, for those who prefer to solder their own connections. Our 2-LED warm white flexible light strip is available in 2-packs with 6" connecting cables. The strips have self-adhesive backing that allows you to mount them pretty much anywhere (even on rounded surfaces). Once you have a power source, this is a great way to get light into your creation. When you need to put light into the smallest spaces, use our Micro Light Boards. Just 4mm square, these will fit just about anywhere-- even inside LEGO® bricks! 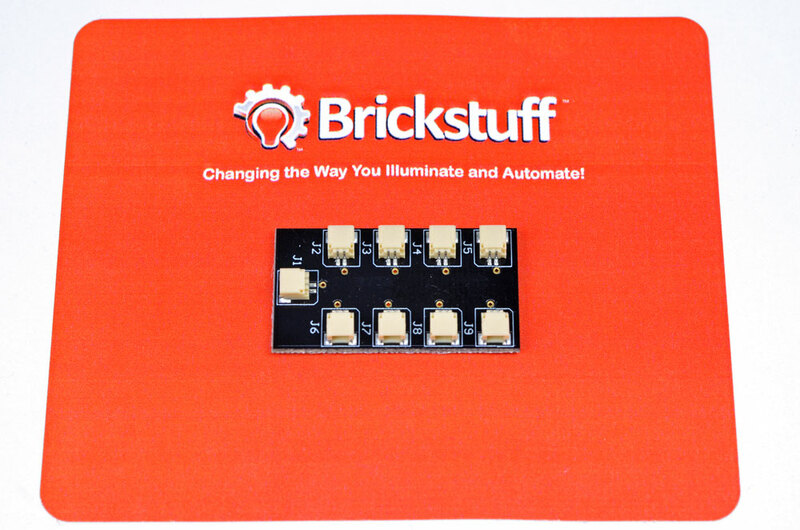 They ship in packs of two boards that also include connecting cables, an adapter board to connect them to other Brickstuff lights, and self-adhesive squares for mounting. Here's where you'll find our custom lights. These are products we've created by making small modifications to existing parts to allow you to create something truly special. 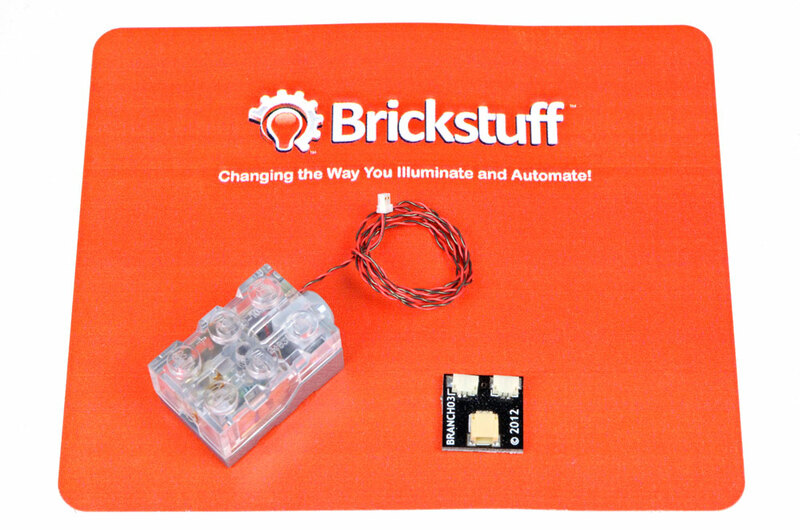 This is a genuine LEGO® light brick with yellow LED in NEW condition that has been modified to include a Brickstuff micro cable for power and control. Also included is a micro connector adapter board. been modified to include a Brickstuff micro cable for power and control. Also included is a micro connector adapter board. What's an awesome lighting setup without power? We offer a variety of power sources and supplies to meet the needs of any size installation. No matter where you will be using your lights (at home, or at a convention where power may be limited) and depending on how many lights you need to power at once (one building, or an entire city), we've got you covered. Need to get your lights up and running quickly? 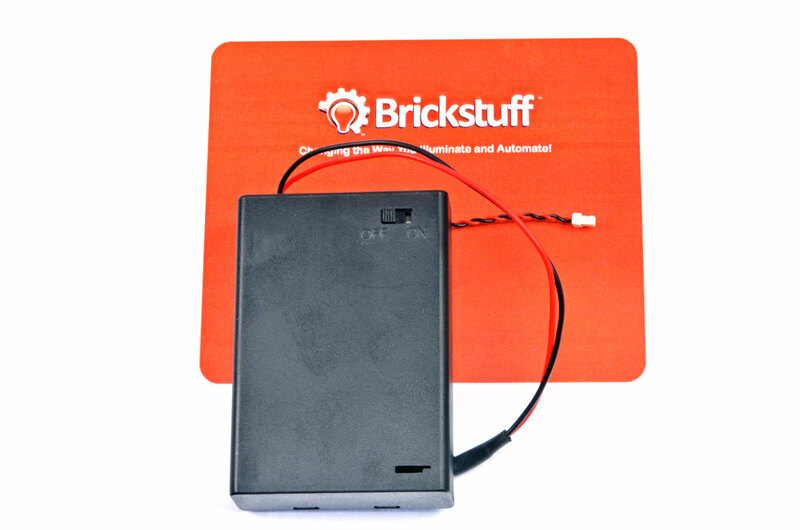 Our AA battery pack with built-in on/off switch will do the trick. 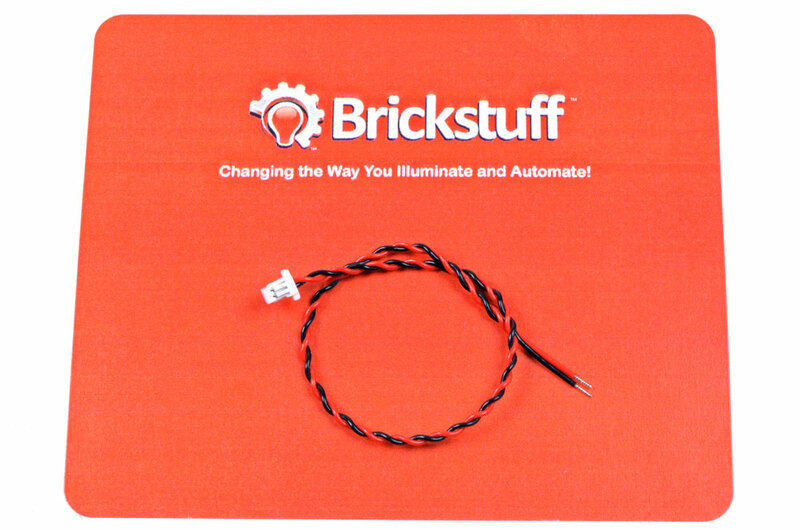 This is a USB cable with Brickstuff power connectors on the end. If you need mobile power, the USB connection works with many of the commercially-available "power to go" portable batteries with USB output (see our FAQ section for some recommendations), or with our Mains Power Supply. Designed to work with our USB Power Cable, this is a 5V power supply that operates on 110-220V AC. It has a U.S. plug but can work with voltages around the world. It has a USB output connector. If you need to fit your lights into a small space, this is the power supply for you! 5V DC and up to 100mA from a single AA battery-- it's like magic. 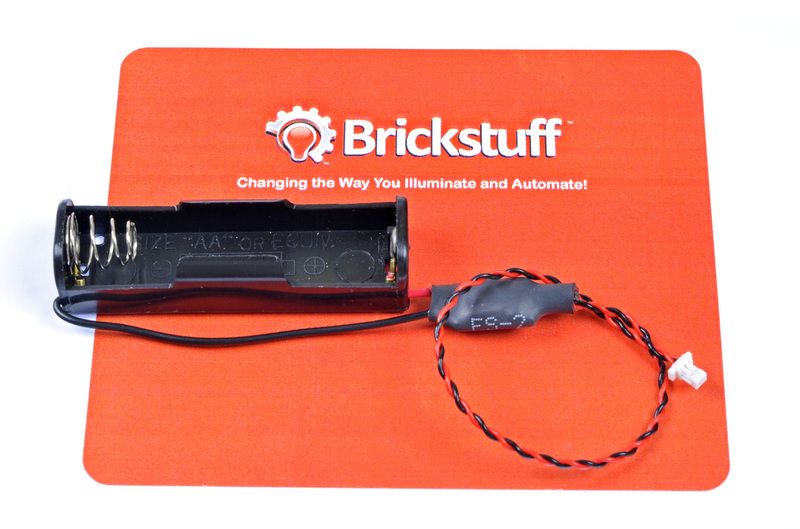 This power source uses advanced circuitry to pull every last ounce of power out of the battery-- it will keep your lighting running until well under 1V remains in the battery! 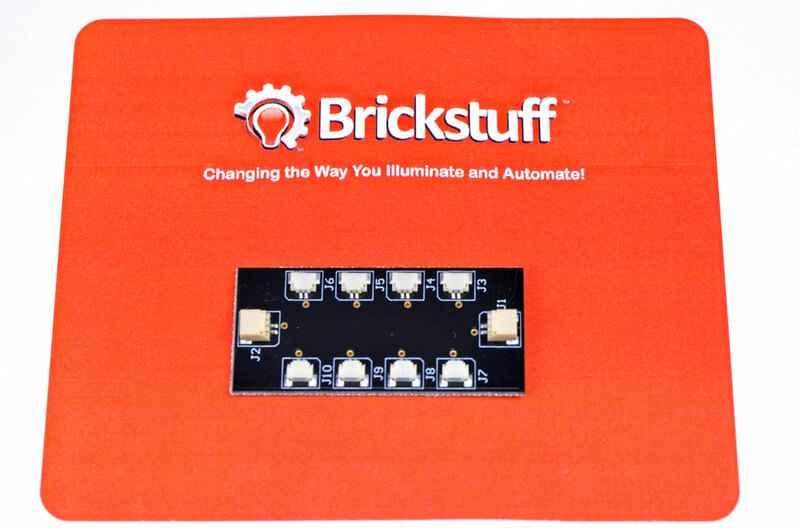 Once you have your lights installed, it's time to spice it up with a Brickstuff Lighting Effect Controller (LEC). Our single-function LEC will control two separate lighting channels and provides 12 lighting effects, including flickering flame, flash, pulse, glimmer, jet engines, runway lights, single and double strobe, random lights, laser cannon, and cannon with explosion. You control the speed, brightness, and intensity of all effects using the thumbwheel on the LEC, and you can add random on/off to any effect with a switch on the LEC. 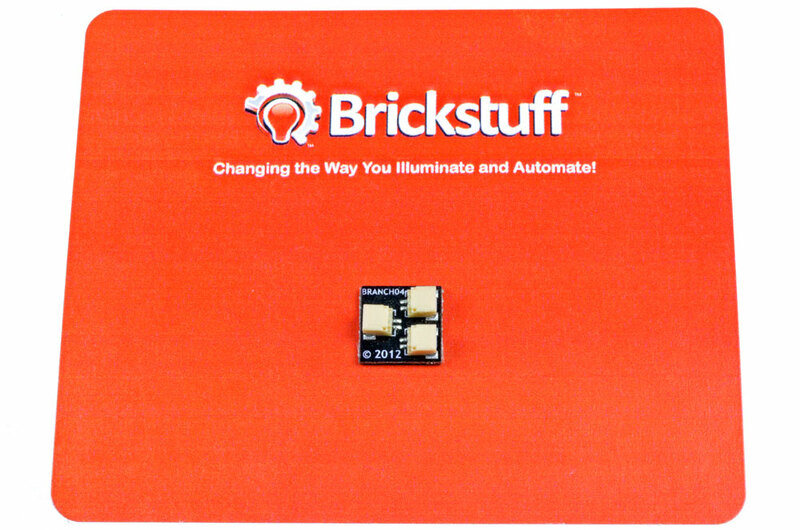 The LEC is tiny-- just 43mm by 14mm, but it can control hundreds of LEDs. It can even manage high-power 1W LEDs directly, for when you need a lot of light. It also has four mounting holes that allow it to attach snugly to LEGO® bricks. Reading about the LEC s one thing, but seeing it in action is another. The video at the top of this page will give a sense of how you might use the LEC in your creation. Click on the "See More LEC Details" button below to see a demonstration of the LEC's 12 lighting effects. Although many of our products include connecting cables and adapter boards, sooner or later, you're going to need to grow. For that, we offer a variety of expansion parts that you can use to take your lighting installation anywhere it needs to go. 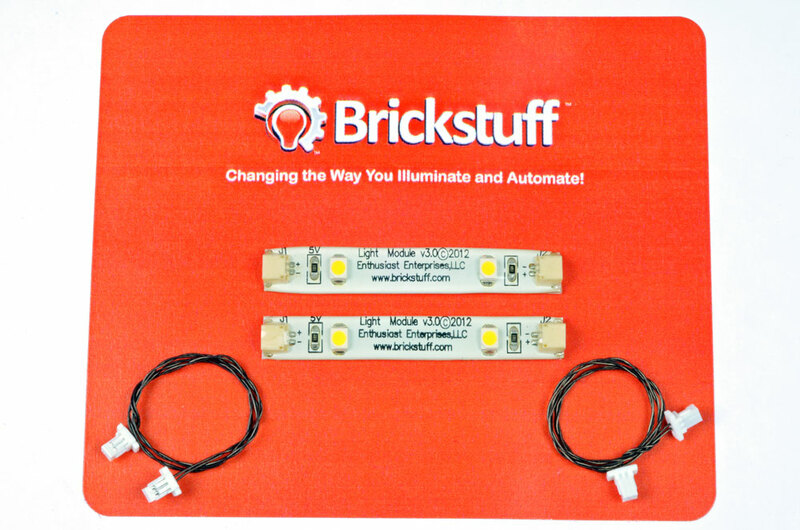 Looking to expand your Brickstuff lighting installation, or to create a custom installation? 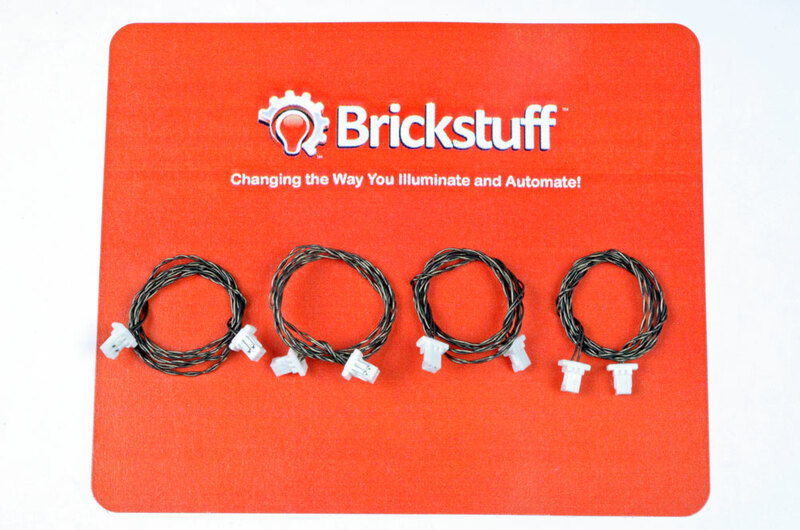 Use these 4-packs of connecting cables to connect our Light Strips, Micro Light Boards, or Lighting Effect Controllers, and fit into whatever space you have available. 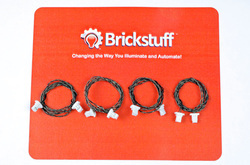 The cables are made of extremely thin, flexible, strong wire, and have Brickstuff standard connectors on both ends. The 4-packs are available with cable lengths of 1.5", 6", 12", or 24". This board has one large input plug, one large output plug, and eight micro output plugs. 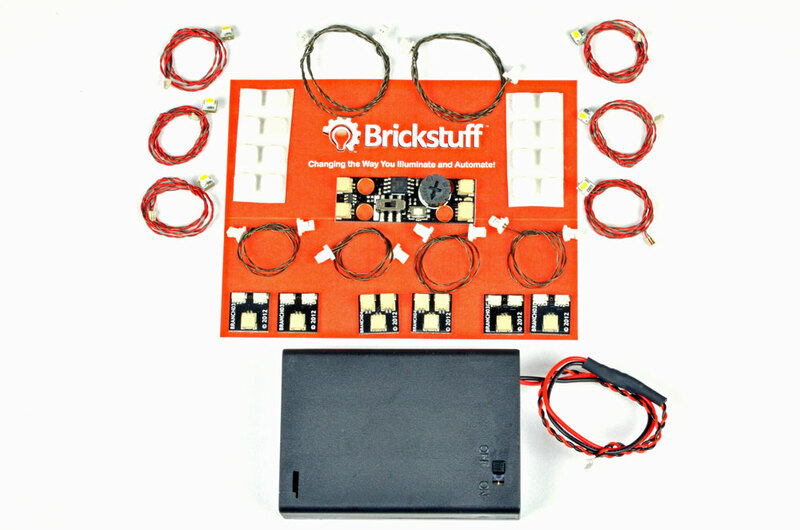 The large plugs are compatible with all Brickstuff power supplies and Lighting Effect Controllers, and the micro plugs can connect directly to Micro Light Boards without needing an additional adapter. 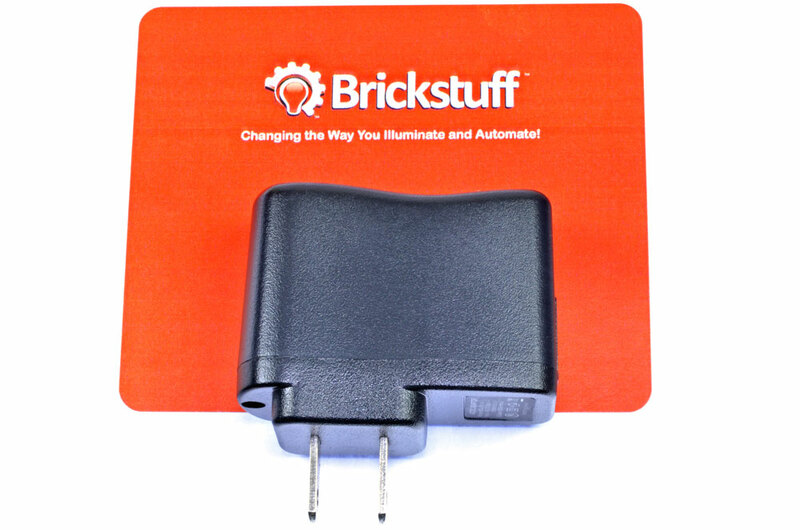 The large output plug allows these adapters to be daisy-chained, or the large plug can be connected to a string of Brickstuff light strips. This connecting cable has a Brickstuff connector on one end and bare wires on the other. 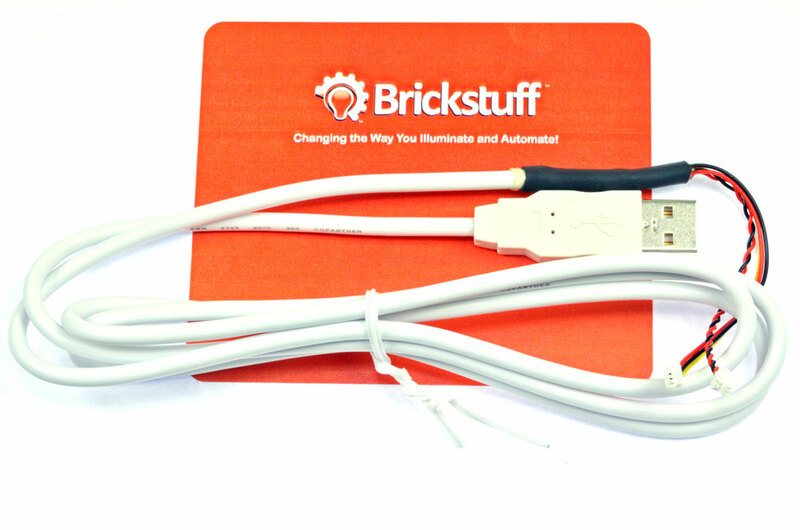 Use two of these cables to make your own connecting cable of any length, or use it to connect Brickstuff parts to Arduinos or other microcontrollers. Use this adapter to turn one output into two. This is great for expanding your installation and adding multiple chains of lights to one output line.